Daughter Amy Woodard fighting cancer for 1 1/2 years Brother Nick passed from cancer July this year --found out today his wife Linda has lung cancer--left lung almost gone -treatment to start tomorrow 10/25,2018---all I can think of is one partner dies and the other follows within 6 months--seen this happen--she is terminal. 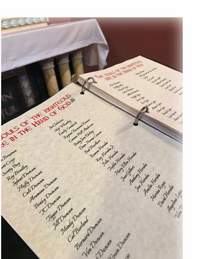 Please pray for the souls of john Dunne-Brady,Mary and Gus Brady, Rita and Thomas Dunne, Mary Schweid, Dorothy and William Egbers, also Thelma and Scott. For understanding God's will regarding Marian Devotion.